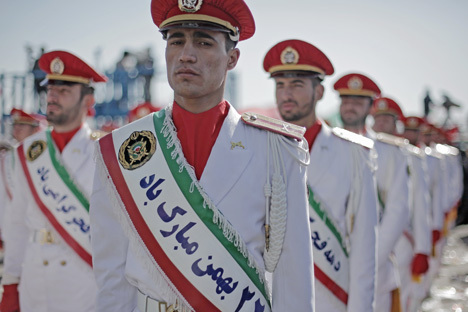 Islamic Revolutionary Guard Corps (IRGC) in parade uniforms during the celebration of the anniversary of the Islamic Revolution in Tehran. While the SCO was in the initial phase of its formation, it specified clearly that a county staying under the UN sanctions can't get full membership, the SCO's Secretary General says. Shanghai Cooperation Organization (SCO) will return to examining Iran's request to membership right after the UN Security Council lifts sanctions from Iran, the SCO Secretary General, Dmitry Mezentsev said in an interview with Izvestia daily. "While the SCO was in the initial phase of its formation, it spelt out the rules specifying clearly that a county staying under the UN sanctions can't get full membership," he said. "The organization wishes success to Iran in the finalization of efforts related to the nuclear program so that the essential legal procedures leading up to the lifting of sanctions were implemented as soon as possible." "I'd like to believe the SCO will take up Iran's request for the status of a full member immediately after that," Mezentsev said. "In line with a decision taken by the heads of state during the year of Russian presidency, full membership will soon be extended to India and Pakistan," he said. The SCO is a permanently acting regional international association of countries set up on June 15, 2001, in Shanghai. The priority areas of its activity are the counteraction to terrorism, extremism, promotion of education, as well as cooperation in the energy sector, transportation, telecommunications, and other technological spheres. At this moment, China, Kazakhstan, Kyrgyzstan, Russia, Tajikistan, and Uzbekistan are full members of the SCO, while Iran has the status of an observer nation.